1.4.1 Why use a Proxy? The Eclipse Foundation runs a Hudson continuous integration server that Eclipse-hosted projects can take advantage of for their builds. Currently this is hosted here: https://hudson.eclipse.org/ . The Hudson server allows for the execution of Continuous Integration Builds, Nightly Builds, Integration Builds, Release Builds, and Testing. 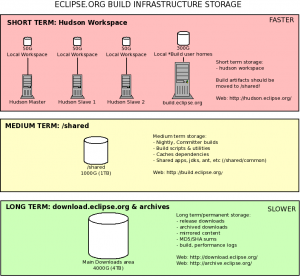 Hudson is maintained by the Eclipse Webmasters. A Hudson sandbox instance is available for those who like the bleeding edge; however, its stability may suffer due to frequent restarts, untested configurations and upgrades. If you had a build running on the old Hudson instance (hosted on build.eclipse.org) and you wish to move it to the current Hudson instance, you will need to file a bug against community->hudson with a subject like 'Move job job-name to hudson.eclipse.org'. Webmaster will then import the job and close the bug. Please note that the new instance does not provide the same plugins as the previous instance. You may also need to update your job configuration to account for differences in the Hudson deployment. The Hudson setup uses 3 SLES 11 x86_64 machines (1 master and 2 slaves), with bash as the default shell. These machines are behind a firewall so any outbound http(s) connections are proxied.